TET 2 Paper Solution Exam Date=20-08-2017 – The State Examination Board was conducted Gujarat Teacher Eligibility Test (TET) 2017 on 20 August 2017 at various Examination center. A large number of candidates appeared in this exam to become a primary teacher. 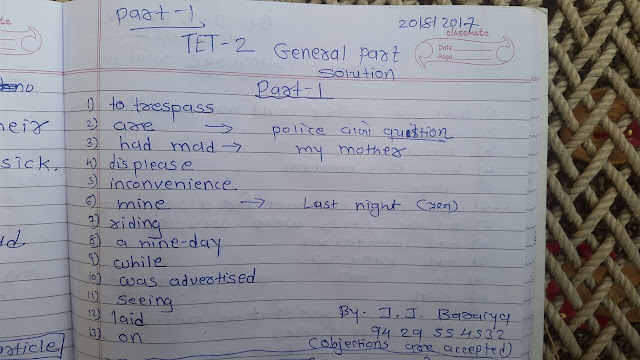 Now they all waiting for TET 2 Provisional Answer Key 2017. The official TET2 Answer Key 2017 will be available soon at official site gujarat-education.gov.in/seb/. The candidates who have successfully attempted TET 2 exam can check un official answer key published by top education site GujaratShine The candidates must visit the official website for TET 2 Answer Key 2017 Download after its release.